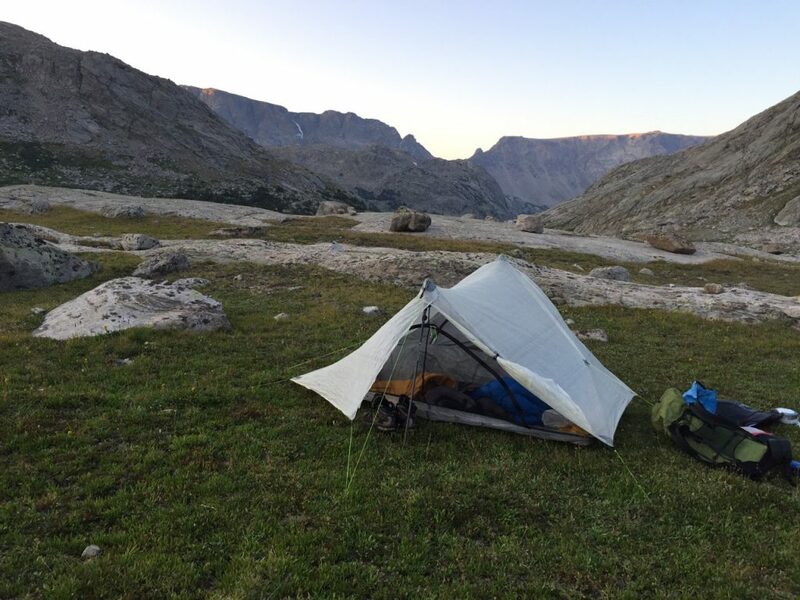 Wind River High Route Day 5 – Douglas Pass and Alpine Lakes Pass. I had been warned that this section of the hike is the crux. It’s true. 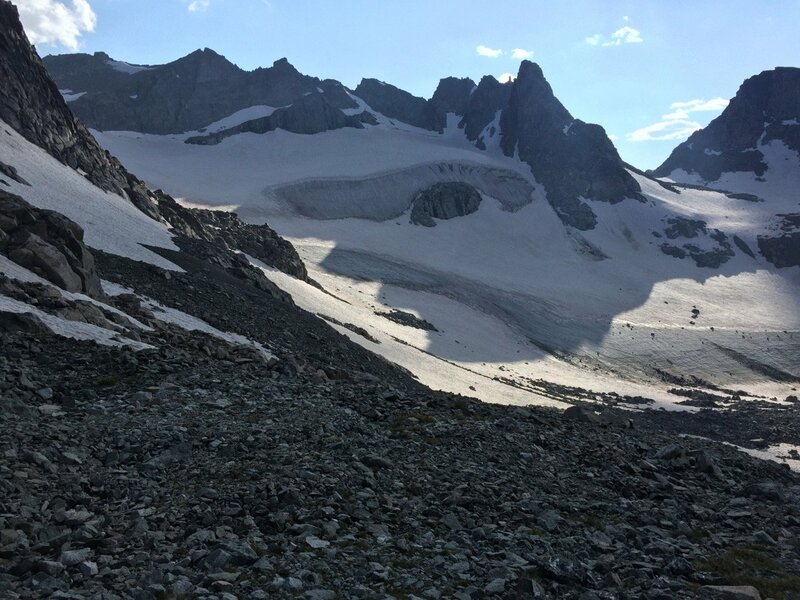 Two big passes and a very complicated and strenuous traverse around the highest Alpine lake. Alpine Lakes was also one of the more remote places on an already remote route. From Lake Louise, there is a pretty good trail leading up to the unnamed lake at 10787. 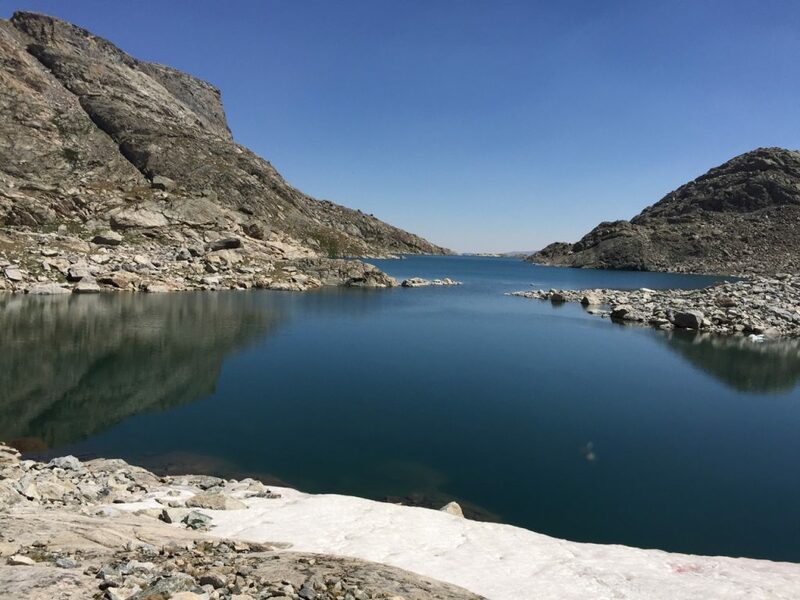 At lake 10787, you leave the trail. The map and route I had showed the route traversing around lake 10787 on the south side. At first, that made sense. 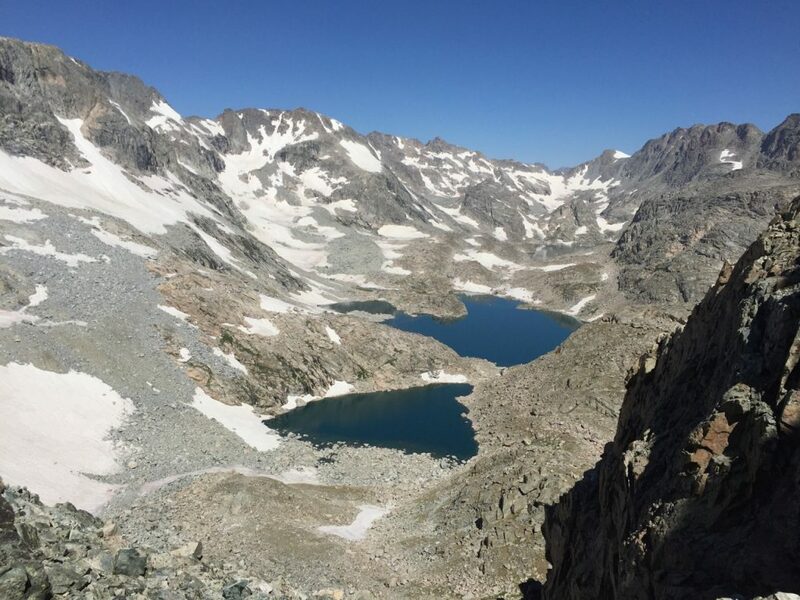 When you look toward Douglas Pass, the south side of the lake is more gentle and looks like the way to go. The north side has a big cliff that drops into the lake; you’d have to climb over the cliff to get around the lake on the north side. 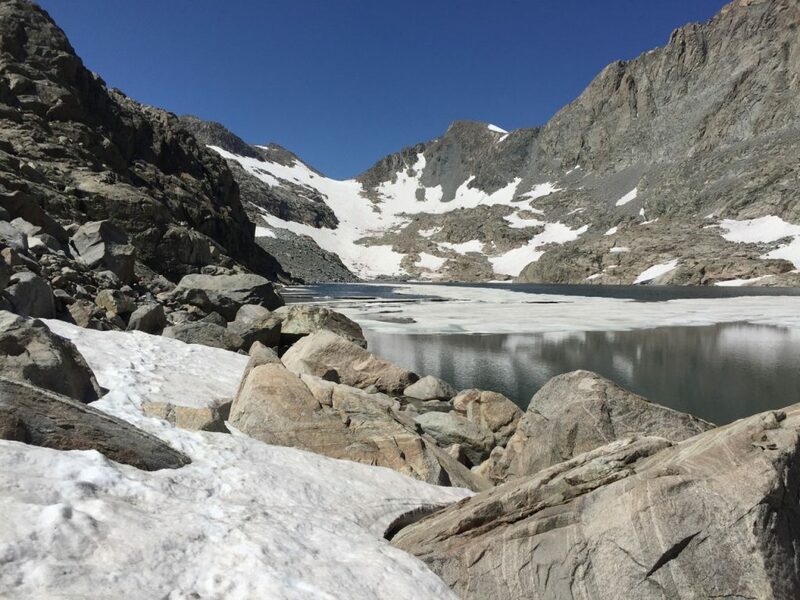 But on the south side of the lake, there was a 35-45 degree snowfield that dumped straight into the lake. Since we didn’t have ice axes, we thought that would be too much of a risk. So we started to scope a route on the north side. We thought there was a way over the top of the cliff and then up to Douglas pass on the big talus field. Turns out, we were correct. The best route is actually on the north side of the lake. 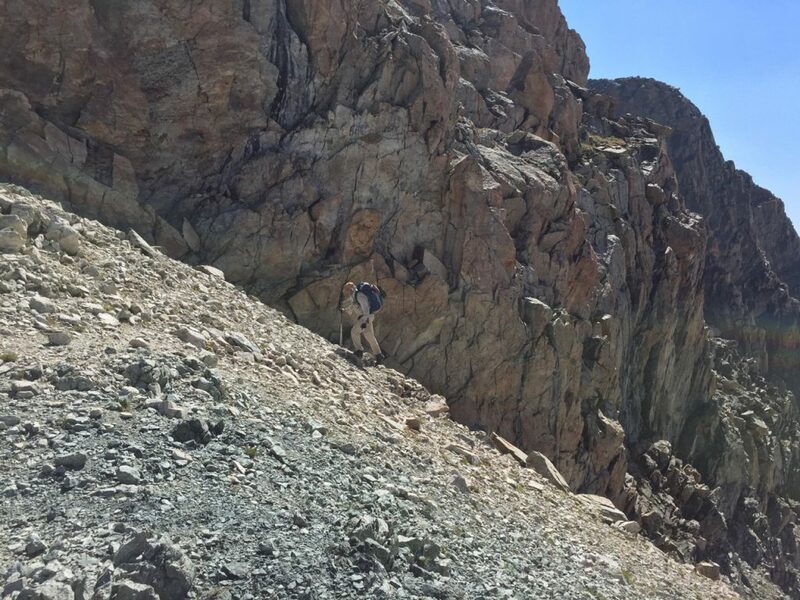 After we climbed over the big cliff, near the lake’s outlet, we kept attempting to traverse back to the talus field. We thought the pass was the left-most low point in the image below. Work Ethic started traversing out into the big talus field. Since I was on a feint trail, I continued up and right until I was right next to the big cliff on the north side of the lake. And there I found a very distinct trail. Then I remembered talking to the guys from South Dakota. They said, “Hug that cliff. 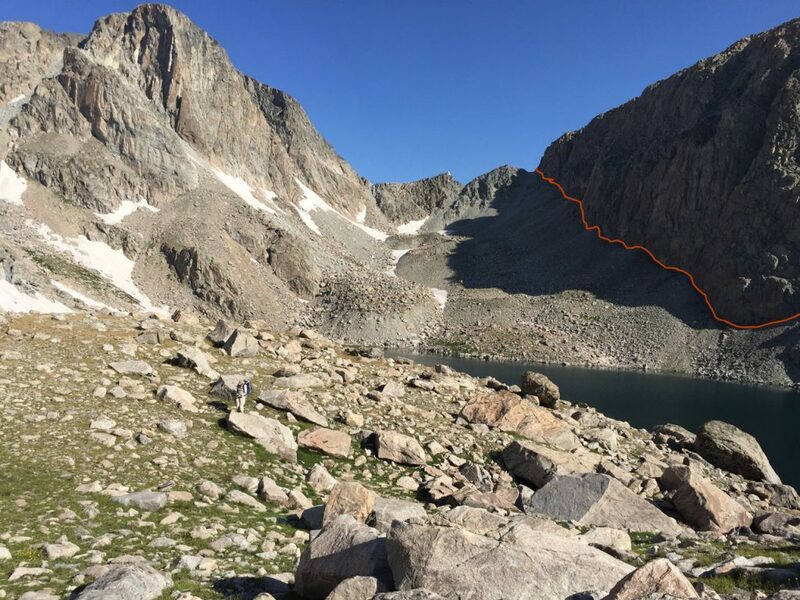 Sometimes you’re pulling up on that cliff wall to keep moving up!” When I first saw Douglas pass from lake 10787, I assumed it was the cliff on the south side of the pass, not the north. Now it all made sense. I hollered at Work Ethic and told him I found the route. 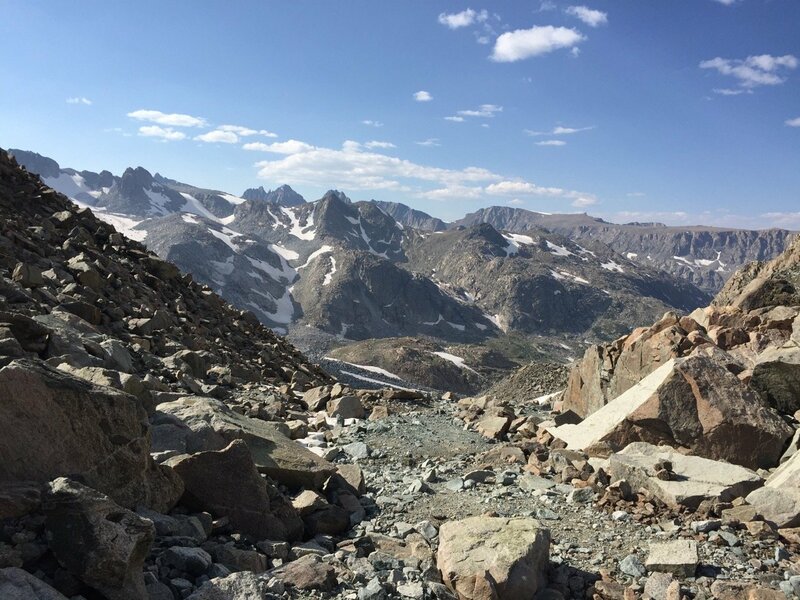 This situation is a perfect example of why it helps to have good route-finding skills on the Wind River High Route. 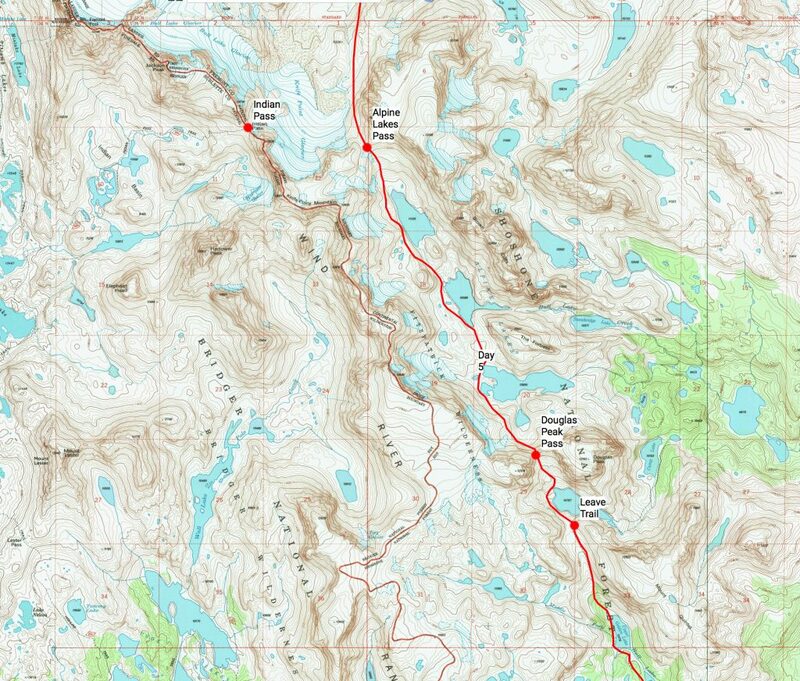 Our inclination was to follow the route shown on our map, but the north side route was better. Even though the route next to the cliff was very steep and lose, it was much better than the talus field below it. The route down from Douglas Pass into the Alpines Lakes basin is very steep, very lose, and very tedious. A real knee buster. But there is a feint trail where many others have done the same descent. Once we got to the first Alpine lake, we were greeted by swarms of mosquitos. So many that I couldn’t breath without inhaling them. They weren’t biting, but I put on my head net just so I could breath. The Alpine lakes are almost 11,000′, but it was like a reflector oven in there, at least 75 or 80 degrees in the sun. The first and second lakes are straightforward. Lots of talus hopping, but simple navigation. 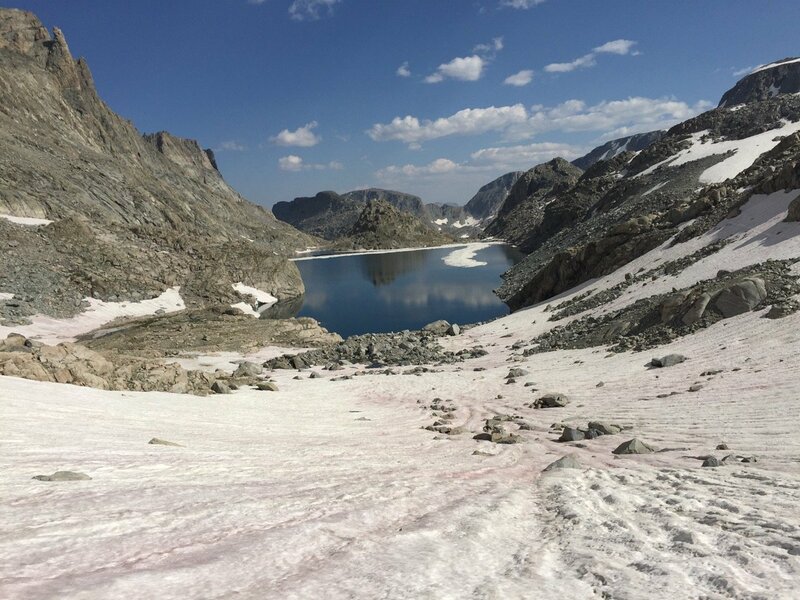 At the third Alpine lake, there was another snowfield, 25-30 degrees. It dumped right into the lake, and we had to cross it. Even though the snow was soft, we decided to put on micro spikes. I didn’t want to slide into that cold water. Just after I started across the snowfield, I heard voices. I thought I must be hearing things. But then I saw a couple of figures at the north end of the lake. They were just standing there looking toward me. I continued across the snow, took off my micro spikes, and then hiked towards the two hikers. I thought it was a strange question considering they must have come over the snow-covered Alpine Lakes Pass to get here. It was that pass that had me worried: it was snow covered and steep. I told them that the snow was very soft, plus we had both just kicked steps, so it was probably fine (they didn’t have micro spikes or ice axes). Also, I recommended that they unhook their hip belts and chest straps. That way, if they did fall into the lake, they could quickly get out of their pack. And I explained how to use a hiking pole as an emergency self arrest tool. I asked where they were going. Both women were in their early 20s, very attractive, seemingly very fit, wearing very new and CLEAN looking gear, scantily clad in short shorts and tank tops, running shoes, and had perfect, clean, tanned skin. And both were wearing brand new Patagonia trucker caps. I was confused. 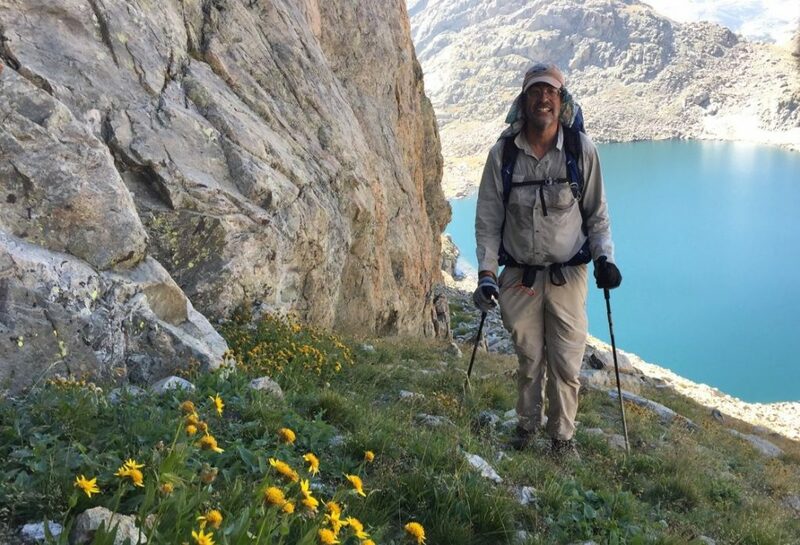 After five days on the trail, Work Ethic and I looked like a couple homeless guys: bearded, dirty, and smelly, faces covered with bumps from mosquito bites, covered head to foot in old, faded, dirty, sun-protective clothing. These two girls looked and smelled like they just stepped out of a Patagonia ad. Did they know about skin cancer? And how could they NOT be covered in mosquito bites? Work Ethic was quiet during this interchange. I think the Sirens had captured his tongue. We continued to the fourth lake, still thinking about the Sirens. Something was not right, but we did not know what. Were we just on Candid Camera? Did they get dropped here by a helicopter? The complications of the fourth lake quickly made us forget the Sirens. There was more to the Siren story as we found out on Day 8. A friend had told me told me to go around the 4th lake on the north side. But I had read online that I should go around the 4th lake on the south side. Both sides had cliffs that dropped right into the lake. That meant that on either side, we would have to traverse above those cliffs. We decide to go around the south side. There was a feint trail now and then, but it would disappear when there was nothing but rock slabs. We did a lot of strenuous scrambling up and down on, around, and across this cliff until we finally exited onto a low-angle snowfield. 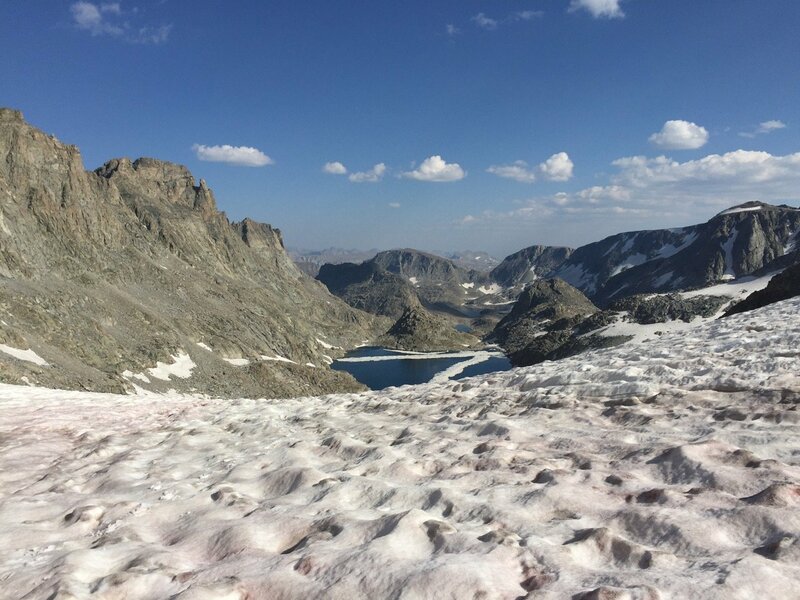 That snowfield led almost uninterrupted up the pass, at times up to 35 degrees. We put on micro spikes for the climb. Although the snow was soft, it was melted down to ice in a few places. I was glad I had the spikes. We descended from the Pass to about 10,800′ and camped in the tundra. The route down from the Pass was steep. We stayed on snow as much as possible, and then found a route down through some rock slabs, thus avoiding big talus fields. 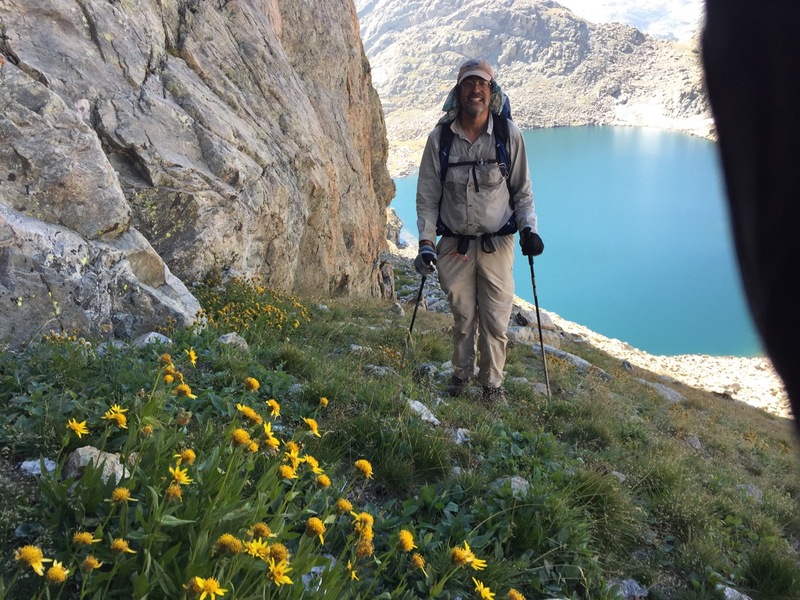 My friend was right: Alpine Lakes was the physical and mental crux of the route. OK, I know it’s powder season, but where’s day 8 and the rest of the siren story? Thanks for the writing – enjoyed this when I read it in October.